HECR Series | Film Capacitors - Electronic Concepts Inc. The Avionicap® HECR type capacitor is a hermetically sealed version of our Avionicap® ECR type series, which has gained broad acceptance in the electronic industry. and system miniaturization are required. 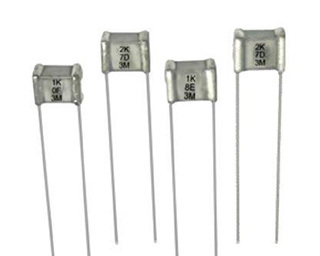 The HECR capacitor is qualified to MIL-C-39022/11, styles CHR20 through CHR25. It features radial leads and miniature rectangular size, measuring as compact s .110″ x .210″ x .240″. Therefore, significantly less area on a printed circuit board is required, as compared to conventional tubular axial leaded capacitors. The HECR capacitors can be supplied with a plastic sleeve to insulate them from other components on the circuit board. 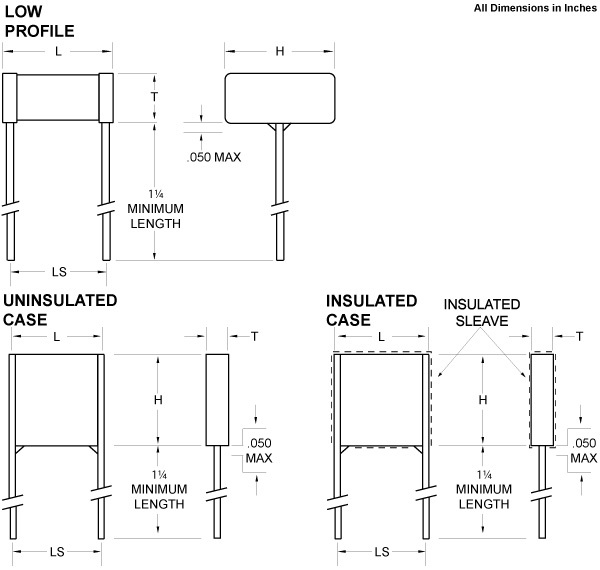 A low profile version ins also available for applications where component height is critical. Electrical properties are the same as those of the standard tubular metallized polycarbonate capacitor even though the package is much more compact. The HECR metallized polycarbonate capacitor represents a competitive edge for the user because of its compact size, more functional shape, MIL qualification and availability. Capacitance is measured at 25°C and at, or referred to, a frequency of 1KHz. Hermetically sealed ceramic case with tinned metal end caps. M39022/11 – also tested to condition C, procedure IIIa. Note: When specifying insulated case capacitors, add 0.025" to the T and L dimensions, and 0.040" to the H dimension.